I mentioned that I used Chinese Long Beans in the taco pasta recipe. In Houston, I buy them in Asian markets, where you'll almost always find them. Specialty grocers may have them occassionaly, but I can't recall seeing them. And I think you'll never find them from a mainstream grocer. The beans are indeed long. In the picture below, the beans are on a 13" wide cutting board. I put the stick of butter there as another frame of reference to their size. Long beans, even when very fresh, have a few mottled dark spots. They are a little thinner in diameter than our typical green beans, and have a slightly chewier texture, even when well cooked. That's why I like them so much in the taco/pasta recipe - that crunch was a nice counterpoint to the soft(er) pasta. In traditional Sichuanese cooking long beans are often dry-fried. This means they are cooked in a small amount of oil in a wok for 6-8 minutes until the skins get a little blackened and blistery. Since we usually can't generate the super high heats needed for good wok cooking, we have to carefully cook over high or medium high heat for about 10-12 minutes. After frying the beans, they are set aside while ground pork, xiao xing rice wine (like sherry), soy sauce and ya cai (a pickled mustard green) are suateed, then finished with salt and sesame oil and recombined with the beans. Delicious. I'm too embarassed to even put the recipe name in the subject line. At least it's not really clipped from a newspaper. It just would sound like it were. We're going on vacation soon, so are cleaning out the fridge. And since Alex is back home after a week+ at Boy Scout camp, he's picking our menus. He wanted tacos, and knew nothing of the Mexican feast we had just a few days before he returned. I generally don't care for "one-dish" meals. However, we had ground turkey in the freezer, some leftover tri-color rotini pasta, and a fresh package of Chinese long beans (more on long beans later). So I decided to mix up a taco seasoning, and combine all those ingredients. Frankly, it looks like a lame suburban "throw it together" dish. However, there were some very nice flavors, subtle enough for picky eaters, and at least the dish didn't get its taco seasoning from a foil package. Actually, a package of taco mix is often used in my house, just not by me. Like most busy households, we've got a few shortcut, go-to dishes that the kids like and are truly fast to make. However, I'll contend that my dish is only 5 minutes slower than Margie's fast taco night.....especially if you don't have to cook the pasta or make this as just a taco dish with tortillas. Ground Turkey and Bean "Taco Pasta"
1 medium onion, chopped. A little more than 1 cup. 1 red bell pepper, chopped. A little less than 1 cup. Bring beans to boil in salted water. Cover and simmer for 6-8 minutes, depending on thickness. Taste for doneness. Drain and rinse under cold water to keep the beans from overcooking. If needed, cook pasta and drain. Let cool. Add onion to a saute pan with 1-2 tablespoons olive oil over medium-high heat. After 2 minutes add red peppers and garlic. Cook vegetable about 4 minutes more. They don't need to be soft yet. Add all spices and stir to combine, then add turkey. Cook about 7 minutes, breaking up turkey into smaller pieces. Add chicken stock and tomato paste and turn heat to high. Stir paste and stock to combine. Allow some of the liquid to cook off slightly (evaporate). Keep cooking until just a small amount of liquid remains. Combine all ingredients in a bowl. 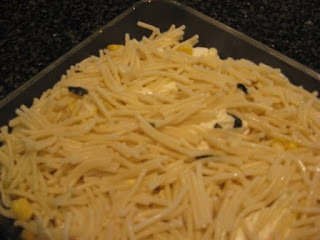 Serve with grated cheese, sour cream, tortilla strips and lime wedges. Using ground turkey. Turkey will absorb the spices and other flavorings better than beef. It's also got far less fat than beef. So much so that you can cook it without draining off fat. That's why we didn't have to brown the beef first, drain it and later return it to the pan with the seasonings and vegetables. The simplicity and focus of a few high quality spices. Margie uses a high quality packaged taco mix called Pioneer Brand. It's good, not great. It's quick and the kids like it. The spices listed are: chili pepper, salt, maltodextrin spices, MSG, food starch, bleached flour, cocoa powder (really? ), spice (which is what??) and citric acid. Compare that to chili, cumin, cayenne, salt and pepper. Focused and simple. All fresh ingredients. That package of taco mix also listed onion as the first ingredient, and you know what that means (largest quantity). Of course it's dried onion. Also listed - garlic. Dried. Compare those to spending less than 5 minutes (and for some of you, less than 3 minutes), chopping a little onion and garlic. One last thought. The reddish color in the packaged version: food coloring. Mine: tomato. Most of the cooking advice you read here involves getting a lot of flavor out of simple, fresh ingredients, using fairly uncomplicated techniques. Maybe it doesn't come across that way you every week, but I try to focus on the basics here, to encourage you to cook more often and (hopefully) with a little less effort. Rarely, if ever, have you seen something out of the ordinary, or made with unusual ingredients, or that uses advanced techniques. This week is totally different. 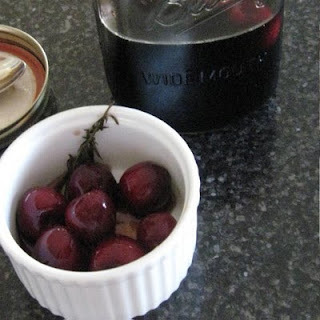 Today let's try something with an exotic flair: Potted Cherries with Cherry Balsamic Vinegar and Tarragon. The recipe is adapted from Thomas Keller, who is generally considered the top American chef of the last decade. It all sounds a little impressive and complicated, huh? Well, it is. You'll need special equipment, you'll have to make one recipe first before you can complete the dish, and it needs to sit for days for flavor to develop. On the other hand, I'm pretty much lying. The point is, even though this recipe originates from one of the greatest cooking minds in America, even though it sounds exotic, and even if the recipe seems complicated, this is actually SO simple. Yes, it's better if you let it sit for a few days, but it's pretty good right away too. That special equipment? If you own a cherry pitter, a little device that pushes the pit through the skin, it will speed things up. If you don't, maybe you have one of those super tiny melon ballers (with a scoop about the size of a.....cherry pit). Lastly, you can use the tip of a paring knife, and twist it around the pit. Attack it from the non-stem side, it's easier. The "make-first" dish? Two ingredients: balsamic vinegar and cherry pits. That's it. The main dish - five more ingredients - water, sugar, black peppercorns, cherries and tarragon. The recipe is in the next post. --- Bring vinegar to a boil, add pits and remove from heat. Cool for 1 hour or more. --- Bring sugar, vinegar, water and peppercorns to a boil, stirring to combine. --- Allow to cool, then remove peppercorns and pour over cherries. --- Add tarragon to mixture and refrigerate for at least 24 hours. The cherries taste best after 4-5 days and last a few weeks, refigerated. Serve sauce and cherries over grilled chicken or pork, as a topping for ice cream or other desserrts, or add a bowl of the cherries to a cheese tray. This is a change of pace this week. Instead of diatribes, lectures, musings and general advice generation, I'm just going to share a simple, fresh summer menu and the recipes. Gameplan: Put salted water for corn / pasta on to boil. Make gazpacho next, to let the flavors develop. Add corn when water boils. Put spice mixture on tuna. The remaining steps - cutting corn, cheese, herbs, draining pasta are simple. This took one hour and 5 minutes end to end in my kitchen this week, including interruptions from children. Adapted from New York times 7/14/2010 issue. Orignal recipe is available on NYT website. 10 ounces greek yogurt (or any plain yogurt). More or less yogurt can be used to taste. -- Blend all ingredients (stick blender or regular blender). -- Chill in coldest part of fridge while making rest of dinner. At least 20 minutes. -- When ready to serve, strain soup through a chinois or strainer, pressing on the solids with a wooden spoon. Scrape the outside of the strainer with a clean spoon. -- Serve with additional basil, olive oil, bread, etc. --- Spread seasonings on both sides of fish. Cover with plastic wrap and let sit 20 minutes at room temp,refrigerated if longer. --- Grill steaks for 2 minutes per side over high heat. --- Add corn, basil, S&P and combine. Add cheese. --- Serve warm or at room temp. 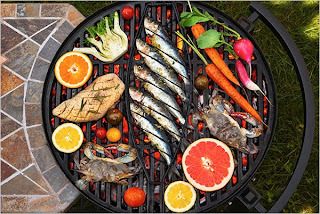 Last week I shared an article by Mark Bittman from the New York Times called "101 Fast Recipes for Grilling". The article is available free online. It contains lots of simple ideas, both familiar and innovative flavor combinations, and enough variety to keep you stocked up with fresh recipes and fresh food all summer long. I had some shrimp on hand and checked the 101 article for ideas. One recipe calls for dusting shrimp with Chili powder, and finish with cilantro and juice from grilled limes. This is a combination of flavors I've been making for years, and recommend it. Rub shrimp with olive oil, salt and cumin. Finish with juice from a grilled lemon, garnish with marjoram. It seemed to me that for this recipe to be good, it needed more spice, pepper or garlic. I tried it, not expecting much. It was a pleasant surprise. Because there were so few seasonings, the flavors seemed more concentrated. The grilled lemon almost had a hint of sweet/sour and was far less sharp than simple lemon juice. Fresh marjoram (or oregano) is not used all too frequently, so it's a refreshing change of pace. The only tricky part is to determine how much cumin and herb to use. I'd say we used about a teaspoon of cumin for a pound of shrimp, then a little more than a tablespoon of fresh chopped oregano. We've enjoyed a summery dish of fresh corn with red peppers for many years. We cut corn off the cob, sauté it with scallions and chopped red peppers, seasoned with cumin and garlic. Oddly, the southwestern-style flavorings for this dish were passed on to me in the cookbook Cuisine Rapide, by Pierre Franey, a classically trained French chef. In the 80's and 90's Franey published a weekly column in the New York Times called The 60 Minute Gourmet, which was a precursor to what Bittman writes today. These two men share a lot of common ground. They believe that people should cook at home more often; they make home cooking more accessible and less intimidating than most people take it to be, and they strongly promote the use of simple fresh ingredients and a small number of flavorings to create a wonderful dish. ----- Add all ingredients to the pan and sauté about 3 minutes, until slightly softened. Many people don't realize that corn is very widely grown throughout China. In fact, you'll see field upon field of corn, sometimes in proximity to enormous rice paddies. Something that really surprised me on a trip to the Sichuan province a few years ago, was to find virtually this same preparation of corn and peppers on the menu at a local restaurant. It's also included in the one truly authentic Sichuan cookbook, Land of Plenty, by Fuscia Dunlop. In the Sichuan version, the corn and peppers are simply cooked in peanut oil and seasoned with salt and pepper. I haven't experienced my blogger and Kindle Publishing making this kind of error before, but after publishing a full article, which appears in full online, Kindle cut it off after about 2/3rds. Hmmm? Here's the rest of this weeks Be A Better Cook. #4: Peeled, whole carrots, rolled in salt, pepper, cumin and brown sugar. Cook over high heat until brown, then move to low heat until cooked through. #30: Chicken leg quarters tossed in garlic, fresh rosemary (or thyme, or oregano,…. ), olive oil and the juice of a grilled lemon. Grill away from heat. #41: (My favorite description, not that I'm sure I'll indulge): Bacon wrapped hot dog. Admit it. You want one. The only downside of an article like that is that he doesn't provide detailed recipes with proportions and measurements. However, the flavors and combinations are almost foolproof. It's grilling, not fine dining or high end cooking. Besides providing nice flavor combinations, Bittman very frequently calls for fresh herbs. You may remember newsletter issue this spring called "The Only Shortcut to Becoming a Great Cook". In it were thoughts about planting your own herb garden, or simply using fresh herbs. If you planted anything a few months ago, the payoff has already begun. If you don't have fresh herbs in your yard or windowsill it's not too late. You can still buy small pots of herbs at garden centers and even grocery stores. Fresh herbs are something you almost can't go wrong with. It's possible to overpower a dish if you put in too much of an herb or mix too many kinds of herbs together. But even that's pretty hard to do. You'll be fine. Try it. Bittman's Grill - note the sardines in the center!